The Peter G. Peterson Foundation (PGPF), is well known for providing research and education on the U.S. National Debt and fiscal policies. Digital media is at the forefront of that conversation. Big Idea has been producing engaging digital communications to execute PGPF’s public awareness mission. 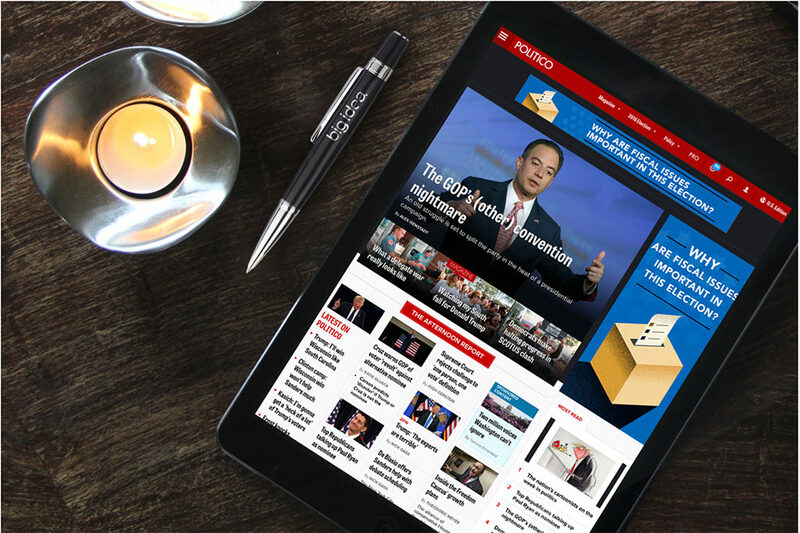 The agency has created infographics, new email templates, landing pages and digital banners on relevant sites like Politico.com. The result is award-winning digital marketing that captivates, educates and most importantly, clicks. Inboxes made better. How do you give an email a refreshing new look? The streamlined approach in PGPF’s email design took text-heavy news releases and transformed them to simple and stylish visual updates on multiple topics with click-through to relevant content. 2016 Election Toolkit a digital landing page chock-full of infographics, videos, charts and other information relevant to the fiscal conversation in this year’s election. Digital Banner Ads Rotating banner designs on relevant sites drive viewers to landing pages with engaging content. Ultimately, attention-getting design with bold simplicity and consistency helps pull users deeper into your content through complex digital pathways. In the information era our attention span is more limited than ever. As every message fights for visibility amidst the onslaught of daily advertising and communications it’s even more important to have content that pops. Whether it’s web, landing pages, infographics, email or digital marketing Big Idea helps pull it all together. The Peter G. Peterson Foundation is a non-partisan organization dedicated to addressing America’s long-term fiscal challenges to ensure a better economic future. Led by Founder and Chairman Peter G Peterson and President and CEO Michael Peterson, the Foundation works with leading policy experts, elected officials, and the public to build support for solutions to put America on a sustainable fiscal path. The Foundation engages in grant-making, partnerships and research to educate and involve Americans from a variety of perspectives.